These new results probe surprisingly large variation in copy number (duplicated genomic segments) and its impact on gene expression. Earlier posts involving CNVs. Thousands of genomic segments appear to be present in widely varying copy numbers in different human genomes. We developed ways to use increasingly abundant whole-genome sequence data to identify the copy numbers, alleles and haplotypes present at most large multiallelic CNVs (mCNVs). We analyzed 849 genomes sequenced by the 1000 Genomes Project to identify most large (>5-kb) mCNVs, including 3878 duplications, of which 1356 appear to have 3 or more segregating alleles. We find that mCNVs give rise to most human variation in gene dosage—seven times the combined contribution of deletions and biallelic duplications— and that this variation in gene dosage generates abundant variation in gene expression. 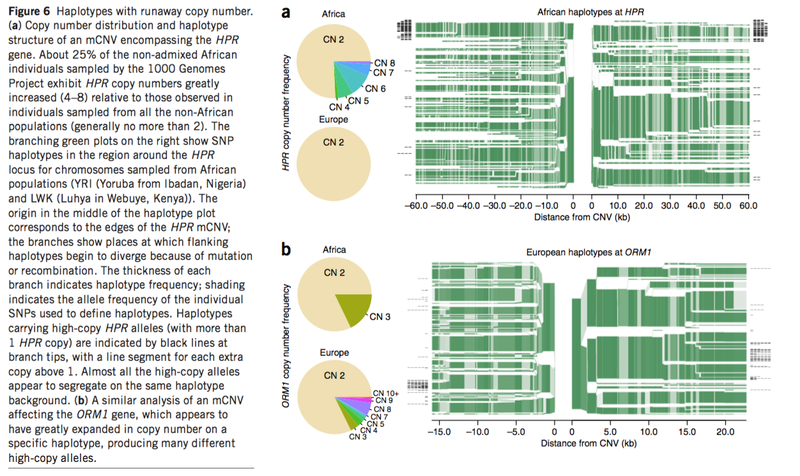 We describe ‘runaway duplication haplotypes’ in which genes, including HPR and ORM1, have mutated to high copy number on specific haplotypes. We also describe partially successful initial strategies for analyzing mCNVs via imputation and provide an initial data resource to support such analyses.